The VN01 double block and bleed valve leans out processes previously required for the job. To find out more about the benefits of this space-saving valve follow the link below to get your copy of our VN01 quick look guide and Block & Bleed catalogue. Having the right tool for the job can relieve a lot of headaches. With Swagelok's VN01 process valve, you'll have save on space, save on weight, and still get top performance for at high temperatures and high pressures. The added capability is due to all-needle-valve construction. The VN01 provides double block and bleed isolation for process piping, and is right at home in the petrochemical environment. 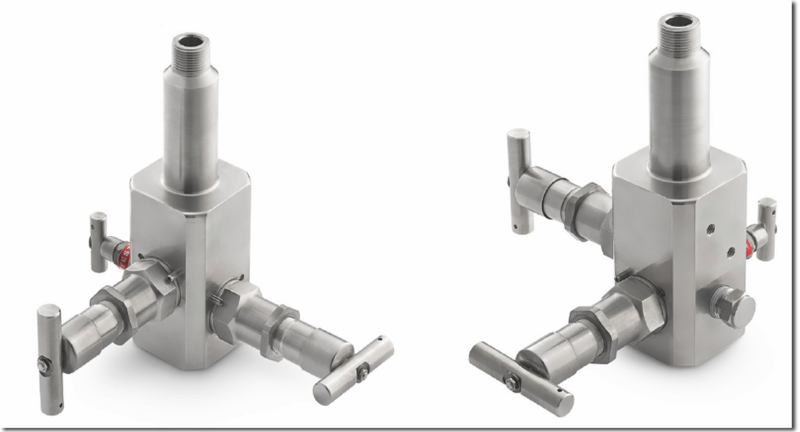 You could get a double block and bleed option in a multi valve, but with the VN01 you have it in a single, lighter, compact unit with a single CRN number. A lighter unit means less strain on your piping system and a reduced need for structural support. That's especially important when you need to protect your components from vibration. The simplified design means you also have fewer leak paths and reduced installation costs. You may already be aware that these kinds of valves exist, but you may not realize that Swagelok makes them. And Edmonton Valve & Fitting has standard configurations in stock. But if you want to explore your options, the VN01 valve has several. You can get it with a standard or 3/4-inch male NPT inlet, or a 3/4-inch pipe weld. For the outlet, you have a choice of a standard half-inch female NPT fitting, but other options are available including a flange. There also are optional gauge ports. If you could benefit from a lighter, more compact double block and bleed isolation valve, contact us through our website or by calling 780-437-0640. We'll be glad to give you more details.